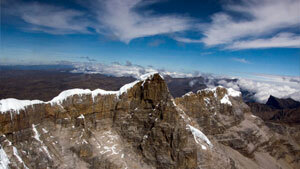 Trekking through Colombia is quickly becoming a popular way for travelers to experience the country. In recent years, many tourists have been turning to the stunning Colombian countryside and taking advantage of the wealth of natural beauty on offer. 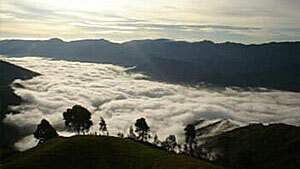 But there’s more to trekking in Colombia than the famous ‘Lost City’ trip or hiking through the coastal Tayrona Park. From mountains to jungle, and Inca ruins to sacred lakes, there are numerous hidden spots in the country where keen hikers and trekkers can explore Colombia’s impressive variety of landscapes. 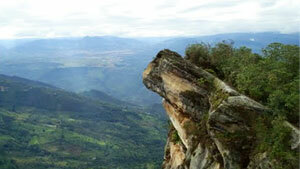 Cuchillas de Bocagrande is a rock formation located in Colombia’s Sumapaz National Park, just 30 kilometers from Bogota. 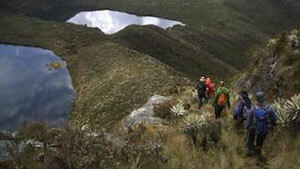 At an altitude of more than 4,000 feet, Sumapaz holds an ecosystem filled with bears, eagles and condors. The rock formation stretches two kilometers and gives hikers beautiful views across the valley, from where they can see cliffs, lakes and wet grasslands – and on a clear day, it’s even possible to see Bogota itself. 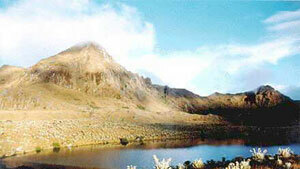 Once a sacred place for the Muiscas, the indigenous people that lived in the Colombian highlands until the Spanish conquest in the 16th century, these three lakes are part of the Chingaza National Park. The protected area is not just a cultural hotspot, but the main source of drinking water in the region. The area is a beautiful natural mountain sanctuary that also serves as a refuge for groups of deer, rabbits, eagles and a recently growing population of spectacled bears. This natural stone wall is surrounded by the Andean forests, and provides an excellent place to see the snow-capped volcanoes of the Colombia’s Cordillera Central. Located west of Bogota and situated between the towns of San Francisco and Subachoque, hiking through the area allows trekkers to see dozens of orchids, mosses and numerous species of birds. The small town of Choachi is located a short hike from the Chorrera waterfall, which falls from rocky outcrops in the Colombian Andes and is reported to be the highest waterfall in Colombia. 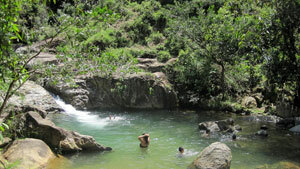 Choachi is also well known for its thermal pools, peaceful countryside and cloud forest. The hike from Choachi to the waterfalls is approximately 15km. Three hours from Medellin in northern Antioquia is a oak tree-filled valley that used to be inhabited by the indigenous Nutabe tribe. Now, the small town of San Jose de la Montaña attracts tourists for the crystal clear waters nearby that are suitable for swimming, and easy hikes around the Central Cordillera. 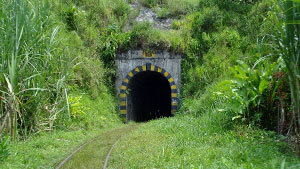 The train tunnel at La Quiebra was built in 1929 and solved the transportation issue between Medellin and Puerto Berrio through the Magdalena River. At three and a half miles long, the tunnel is the second longest in Latin America and the seventh in the world. Walking through the tunnel is now a popular activity for those visiting the town of La Quiebra, known for its beauty. The walk takes about an hour until you exit the tunnel and reach the Nus river bank, where you continue on a path until reaching the railway town of Cisneros. San Rafael is a small town in Antioquia that is only a 30-minute bus ride from tourist hotspot Guatape, but walking along the well paved highway and descending into the valley by foot is a much more recommended option. The 20-kilometer route doesn’t feature much traffic, meaning many choose to cycle one-way to San Rafael. Companies in Guatape provide bike hire and can arrange transport back from San Rafael. In the region surrounding the town there are numerous types of birds and monkeys, coffee and cacao plantations, several rivers to swim in and even opportunities for cliff jumping. 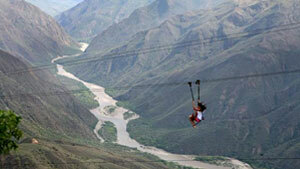 Chicamocha canyon ridge is a spectacular location for hiking. For 7 kilometers, walkers look down to the Chicamoya River, a reminder of the water erosion that formed the canyon and resulted in the steep cliffs on either side. A 6.3km long aerial tramway crosses the canyon from one end to the other>, affording incredible views directly into the canyon itself. The Sierra Nevada de Cocuy is a chain of over twenty snow covered peaks that are surrounded by lakes, glaciers, and waterfalls, and is the largest mass of ice in Colombia. The high altitude trails in El Cocuy National Park can present a challenge for many mountaineers and climbers: embarking on the famous 6 day hike is only recommended for those with a lot of experience. 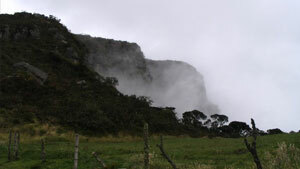 Professional guides found in Bogota or the nearby town of El Cocur and Guican take visitors on day hikes around the region, where cabanas on the trails are provided for sleeping. 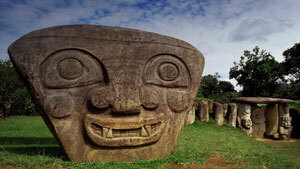 The archaeological site at the town of San Agustin is one of the most important in the continent. The pre-Hispanic cultures that inhabited this region of Colombia for over fifteen centuries left 500 carved stone sculptures that are thought to relate to funerary rites and sarcophagi. The site is filled with burial mounds, terraces and earthen walkways and is surrounded by jungle, rivers and waterfalls, making trekking in the region a fascinating experience.